“The Lord (God of Israel) hath made bare His holy arm (now “Holy arm of the Lord” is one of many titles or names, given to the Messiah of Israel — see Psalm 98/(1-3); Psalm 77/16; Isaiah 40/10; Isaiah 59/16; Isaiah 63/5; — thus the Messiah is like “part” of God. Behold, My servant shall prosper, he shall be exalted, and extolled, and be very high (thus this “servant of God”, the Holy arm of God, will be like God, as God is usually described in this way — exalted, extolled (praised), most high). “Who would have believed our report? (this story of the Messiah is very hard to believe as it is fantastically incredible) …and for whom is the arm of the Lord (a title for Messiah as mentioned above – this Messiah is “part” of God) revealed? For he grew up before Him as a tender plant, and as a root out of dry ground: (Isaiah 9/(5-6) states the Messiah will come from the line of David, and Micah 5/1 states the Messiah will be born in the city of David — Bethlehem — which, by the way, means “house of bread” in Hebrew). He had no form nor comeliness; and now we look at him who was no beauty and we desire him. He (the servant of God, the “arm of the Lord”) was despised and rejected of men; (Isaiah 49/7 also states that the Messiah, the “Holy One” of God is despised and abhorred). A man (singular) of sorrows, and acquainted with grief: and we (the children of Israel) hid as it were our faces from him; he (the “arm of the Lord”, the Messiah of Israel?) was despised, and we esteemed him not. But verily he hath borne griefs inflicted by us, and suffered sorrows we have caused: yet we did esteem him stricken, smitten of God and afflicted (Zechariah 12/10, and 13/6 states that the Messiah was pierced and had wounds in his hands, wounded in the house of his friends). Though he was wounded through our transgressions (sins), bruised through our iniquities (wickedness): yet the bond of our peace is upon him, and in his fellowship we shall heal ourselves (i.e., we get atonement for our sins and healing, through the Messiah’s sufferings as our scapegoat, like in Yom Kippur). All we like sheep have gone astray; we have turned everyone to his own way; (i.e., everyone is doing “his own thing” instead of keeping the commandments and statutes of God). .. . and the Lord hath caused the iniquity of us all to fall upon him (like scapegoat in Yom Kippur — Annual Day of Atonement for sins of Nation of Israel — when the high priest puts the sins of whole nation of Israel onto it — see Leviticus 16/10, (21-22)). He was oppressed, and he was afflicted, yet he could not open his mouth: as a lamb which is brought to the slaughter (just like Passover lamb in the Torah — 5 books of Moses — e.g. Exodus 12:1-14, and also like the other animal sacrifices in the Torah, for the atonement of sins — e.g. Leviticus 16/9, (15-19)).
. . . and as a sheep before her shearers is dumb, so he could not open his mouth. He was taken away from rule and from judgement; and as for his generation who should have spoken for him? For he was cut off out of the land of the living (i.e. killed — also Daniel 9/(25-26) states that the Messiah, the Anointed Prince — another title of Messiah — would be killed. N.B. 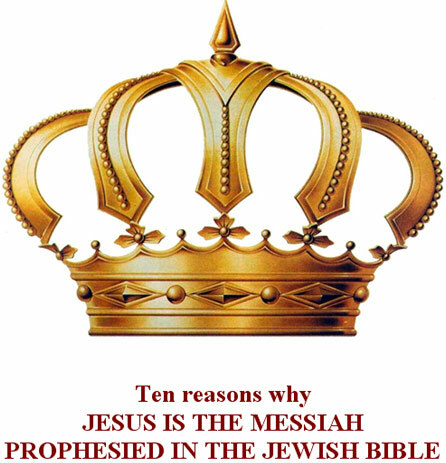 “Messiah” means “The Anointed One” — but to distinguish from other “anointed” persons, such as King David, the Messiah’s more correct title is “The Anointed Prince”. Incidentally, some Bible scholars say King David, who lived in 1000 B.C., predicted the method of execution of the Messiah in Psalm 22.).
. . . he was stricken through the transgression of my (the children of Israel) people. (i.e. he was sacrificed as a sin offering, like the animal sacrifices mentioned in the Torah — e.g. Leviticus 16/9, (15-19)). For one made his grave among the wicked, and his tomb among the rich; because he had done no violence, neither was any deceit in his mouth (i.e. he was a good, honest person). But it pleased the Lord to bruise him; He hath put him to grief: saying, If his soul shall consider it a recompense for guilt (i.e. the Messiah’s soul was offered as a sacrifice to compensate for guilt of sins committed). He shall see his seed (the people that follow the Messiah and receive the benefits of the blessings of forgiveness of sins through the Messiah’s atoning sacrifice), he shall prolong his days, and the pleasure of the Lord shall prosper in his hand (i.e. the Messiah will rise from the dead — and resurrect — to achieve this, as indicated in Psalm 16/(10-11)). He shall see of the travail of his soul, and shall be satisfied; by his knowledge shall my servant (the “arm of the Lord” — the Messiah of Israel) justify the righteous before many, and he (the Messiah) shall bear their iniquities (like scapegoat of Yom Kippur as mentioned above). Surely I will divide him a portion with the great (great honour and glory bestowed on Messiah as indicated in Daniel 7/13 and Psalm 110), and he shall divide the spoil with the Strong (this is also indicated in Psalm 2/(6-8)); because he (the “arm of the Lord” — the Messiah of Israel) hath laid open his soul unto death, and was numbered with transgressors; and he (the Messiah) took off the sin of many (made atonement for their sins through his own blood sacrifice as the “Passover Lamb of God” — Leviticus 17/11 states that atonement for sins is done by the shedding of blood). .. . and made intercession for the transgressors (prayed to God to forgive those who killed him). Now, dear reader, what is your verdict? Who is the person described in Isaiah Chapter 53? Was the person, the prophet Isaiah, as some Rabbis say? Well, tradition says the prophet Isaiah was killed by being “sawed” into two pieces, for preaching “bad news” to the King and elders of Israel. Now the prophet Isaiah himself acknowledged that he was not a sinless person, but like every­body else in Israel, “a man of unclean lips” — see Isaiah 6/5. Hence he could not be offered as a pure, holy, sinless, sacrifice for atonement of sins, as the Lord God of Israel demands a holy one, without sin, as exemplified in the demand of the animals being sacrificed in the Tenach, to be without spot or blemish — e.g. see Exodus 12/5; Leviticus 9/3; 14/10; 23/12. Or was the person, the Messiah of Israel, the Holy One of Israel; who is unique in being pure, holy, sinless; and thus the only one acceptable to God for the sacrificial atonement and for­giveness of sins of sinful people? Or was the person the whole nation of Israel, as some Rabbis say? In my opinion, this opinion is without good foundation, as the scripture definitely describes a single person, and compares this single person to the whole nation of Israel. Also this person is described as Righteous servant of God, while Israel as a nation was a people laden with iniquity, a sinful nation, as the prophet Isaiah himself states (e.g. see Isaiah 6/5 — “a nation of unclean lips”). But what is your verdict, dear reader? If the person described is the Messiah of Israel, then has he already come — a jew, from the line of David, suffering great anguish and pain, etc, for the forgiveness of sins of guilty people? Or is he yet to come? What do you think, dear reader? May the Lord God of Israel bless you with the truth, so that you will have a new heart and spirit, forgiven of sins, as described in Ezekiel 36/(24-29), and Jeremiah 31/(31-34). Knowledge of the truth with corresponding respect for it, will set you free. This gives the time of the coming of the Messiah, which will be before the destruction of the Second Temple, at which time the rebuilt city of Jerusalem (previously destroyed in 586 BC, with the First Temple), would also be destroyed. This happened in 70 A.D., under the Roman General Titus. My Comment: This happened in 70 A.D. The Messiah was predicted to come before 70 A.D., and would be killed. This points to Adonai Yeshua Ha Mashiakh (Lord Jesus Christ). This gives the birth place of the Messiah, Bethlehem, which is the Hebrew word for ‘house of bread’. What a coincidence , because Jesus said he was the “bread of life”. There are now virtually no Jews living in this city, as it is now an Arab town. Thus, it is very unlikely for a Messiah to be born there now. Also, it would rule out a certain recently deceased old Rabbi, presently declared by some Orthodox Jews as “King Messiah”, because he was not born in Israel. This is about the Messiah coming to Jerusalem on a donkey (which is what Jesus Christ did). It is difficult to imagine Israel’s Messiah coming to the Knesset (Israel’s Parliament) on a donkey in this modern age and time. Also, the above-mentioned deceased old Rabbi, declared by some Orthodox Jews as the Messiah, was driven in an automobile, not on a donkey. My Comment: This is about the return of the Messiah at Armageddon, in divine glory. It indicates the Jewish Messiah of Israel is the God of Israel – the Holy One of Israel, and was crucified, but now alive, in divine glory, to rescue the Nation of Israel. Of the increase of his government and peace, there will be no end. He will reign on David’s throne and over his Kingdom, establishing and upholding it with justice and righteousness, from that time on and forever. “’The days are coming’, declares Yahweh (the God of Israel), ‘when I will raise up from David’s line a righteous Branch, a King who will reign wisely and do what is just and right in the land. In his days Judah will be saved and Israel will live in safety. My Comment: This states that the name of the Messiah, who will come from the line of David, is Yahweh, the name of the God of Israel. It also states that He will bring peace to Israel, reigning as its King on the throne of David, during the MillennialKingdom. With regard to the above scripture, the Talmud (orthodox Jewish writings) states that there are three who are called Shem ha Meforash – the Tetragrammaton – the Distinguished Name of God Almighty – Yahweh. Thus one can deduce that this points to the Holy Triune God – One God manifested in three divine persons – Father, Son, Holy Spirit. This shows that God has a divine Son. This explains that the Messiah is the Almighty Son of God, and is to be honoured. This passage indicates three divine beings, the third One being the Holy Spirit. This is the Holy Trinity. By Moshe Elijah, Messianic Jew.